2014 is the 40th anniversary of the bombing of Cafetería Rolando in Madrid. The attack was a significant event in the fight against Francoism and a defining moment in the ETA’s struggle for independence. I first learned about Cafetería Rolando several years ago, and it forms part of my upcoming book, Death in Valencian Dust. In posting this, I do not endorse either side of the ETA struggle, merely recognise the struggle Spain suffered in the 1970’s. In 1974, to say Spain was at a crossroads would be an understatement. In December 1973, Admiral Luis Carrero Blanco, Spain’s Government President was assassinated by ETA (Basque – Euskadi Ta Askatasuna, Spanish – País Vasco y Libertad, English – Basque Homeland and Freedom), the Basque Country separatist group. For years, ETA had been carrying out attacks and killings around Spain, while other groups started to rise up against the government. In 1974, new Government President Carlos Arias Navarro set up new rules during the spirit of 12 February, keeping in line with Franco’s harsh regime of times past, covering everything from stopping freedom of the press, restriction to the judicial systems, harsh penalties for strikers and protesters, and generally restricting the lives of everyone in the country, everyone outside the búnker, the group of extreme right-wing people surrounding Franco. The state of the nation deteriorated throughout the year – the church increasingly voiced their opposition to Franco and the regime, the execution of anarchist Catalan Salvador Puig Antich brought people to the streets in protest, the economy slumped, the Communist party mobilised in defense of their sympathisers, workers continued to strike, and universities protested the new draconian laws. Franco himself was seriously ill, and Juan Carlos, his protegé, was taking over all tasks on his behalf. The Portuguese dictatorship collapsed, giving Spaniards more ideas of what they could achieve for themselves. On September 11, 1974, Arias Navarro re-endorsed his changes and announced efforts would double to enforce new laws over the rising tide of anger. Cafetería Rolando, at 4 Calle del Correos (known as E street), was located in the heart of Madrid, directly off Puerta de Sol. Cafetería Rolando was a large and popular cafe, the local spot for police to visit during their lunch breaks, conveniently located beside the headquarters of the Dirección General de Seguridad (General Directorate of Security) in the famous Real Casa de Correos building. The Dirección General de Seguridad was considered an impenetrable target by ETA and other organisations keen to bring down the regime. Because nearby Cafetería Rolando was so popular with police working nearby, the place became destined for disaster. On September 13, 1974, at 2.35pm, during a busy lunchtime, a bomb exploded at the entrance to the cafe. The bomb, thirty kilos of dynamite filled with nuts for shrapnel, went off as many enjoyed their lunch, and was large enough to cause serious structural damage to the five-storey building. The ceiling of the café collapsed, resulting in several of the hostel guests upstairs falling into the café. The blast was big enough to shatter the windows of the Real Casa de Correos across the tiny street and several cars were obliterated. Another restaurant, a large place with 300 seated guests next door, was also seriously damaged. Because of the proximity to the security building, police were on the scene immediately, and the process of saving Cafetería Rolando diners began. An attack of this magnitude, on a place frequented by everyday people, hadn’t been undertaken since the Civil War, catching all by surprise. Seventy-one people were pulled alive from the rubble, several children. Most victims made a full recovery, though several were left with scarring and mutilation. In total, twelve people were killed, aged from 20 to 78 years old, including a just-married couple. Several café workers were killed, including one who was pulled alive from the rubble but died before surgery. While the attack was allegedly against the police, and several wounded were police and from Franco’s elite special forces, the rest killed were all civilians. A thirteenth victim, a police officer, died two years later from the attack, unable to survive the injuries he sustained. The list of the dead only fueled speculation of the bombing. As no police officers were listed among the dead, a theory sprang up that a division of the extreme right themselves planted the bomb. Police earlier that day had been told to avoid the café, but these rumours were never directly admitted. Franco was keen to catch whomever had committed the act, while others, both for and against the government, took the opportunity to criticise the regime, plus Arias Navarro himself, and the búnker, the powerful political families. Everyone had an agenda for establishing blame. The Communist party became a popular target for criticism, initially blamed for the events. Soon, blame fell on ETA from the Basque Country. They had been killing policemen and guards sporadically since 1968, one just days before the bombing. ETA denied any knowledge of the Cafetería Rolando attack, though throughout Spain, the denial wasn’t taken seriously. Because of the high number of killed and wounded were merely civilians at lunch, both sides of the political fence wanted to see justice done. The assassination of Carrero Blanco less than a year earlier didn’t raise tempers, but the attack on the café brought ETA’s organisation more into the spotlight than ever before. Famous Basque activist, writer, women rights campaigner and ETA supporter Eva Forest was arrested along with her husband, though her husband was soon released. Forest refused to co-operate and accused the police of ill-treatment during her detainment. It was alleged two Basques, a man and a woman, planted the bomb in Cafetería Rolando, sticking the bomb to the underside of a table, and set off the timer. The identity of those two Basques were never established. It could have been Forest and her husband, playwright Alfonso Sastre, but there was no proof. While many detained in connection to Cafetería Rolando and the Carrero Blanco assassination were released, Forest was kept in prison until 1977, when all political prisoners accused under the Franco regime were given amnesty, to smooth the way for democracy under the new King Juan Carlos. It was rumoured that Forest suffered terribly being in jail, being tortured for all her acts over the years. While Forest admitted to passing on ETA messages and helping with safe houses, she never admitted her part in the Rolando bombing, despite admissions from others in the plot. Because of the 1977 amnesty, no one was ever held accountable for the Cafetería Rolando bombing, and no one can never be convicted of any crime relating to the incident. Félix Ayuso Pinel, police inspector aged 46. Pinel didn’t die until 1977. Thanks for the story and especially the photos of the Cafeteria Rolando bombing of 1974! Few people now will react much to this scene because it looks like countless other tragedies occurring in the world today. The photos look like they could be from Syria or Iraq or even WWII. However, this is of special interest to me since I was at the scene in 1974. I was serving as a missionary for the Church of Jesus Christ of Latter-Day Saints (LDS or commonly, Mormon). I had been arrested earlier that day in another part of Madrid for ‘distribution of unauthorized material’ (a completely bogus charge but that’s another long story) and was sitting in a jail cell directly across the Calle Del Correos (about 30 meters from the blast). I was released the following day after 24 hours and had an up-close view of the aftermath. 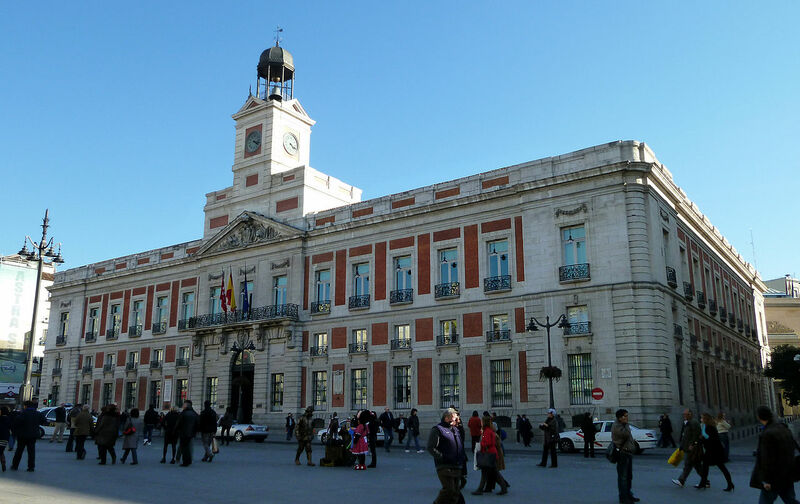 The whole area had been cordoned off from civilians; however, the prisoner release exit was across the street from Cafeteria Rolando and I was able to witness the devastation that had occurred as I walked out to the Puerta Del Sol. I was amazed at what damage was caused by a single hand-carried explosive. I have told this story occasionally over the years to family and friends but have never had access to the photos you have collected here. I sent links to your site to several of my family and they are amazed to see the images of an incident that I was indirectly involved with 40 years ago. Thanks again…I now need to find your book and read your perspective!